Rotate in your seat and easily transition from conversation to conversation in this swivel glider chair. The glider base allows you to gently rock back and forth in your seat. Rolled arms are adorned with nailhead trim, conveying a sense of traditional style. 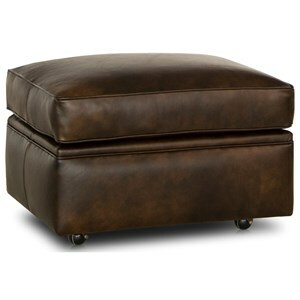 A thick cushion offers ample comfort, while the heavy-gauge coil springs promote the seating support you need. The 528 Traditional Swivel Glider Chair with Rolled Arms by Smith Brothers at Sprintz Furniture in the Nashville, Franklin, and Greater Tennessee area. Product availability may vary. Contact us for the most current availability on this product. Browse other items in the 528 collection from Sprintz Furniture in the Nashville, Franklin, and Greater Tennessee area.